On January 6, 1870, Central Prison opened in Raleigh. The first three prisoners—one man and two women—had been convicted of robbery in Johnston County. Prior to the prison’s opening, North Carolina did not have a central, state-operated prison and instead relied on the counties to manage inmates. Central Prison’s construction was proposed as early as 1846, but did not begin until the adoption of the North Carolina Constitution of 1868 as part of Reconstruction. A committee appointed by the General Assembly originally chose a tract in Chatham County for the prison, but the legislature opted for a site near downtown Raleigh. Prisoners were housed in temporary structures until the first permanent building was completed in 1884. Though inmates accounted for most of the labor used to build 1884 structure, some outside help was brought in, perhaps most notably stone carver W.O. Wolfe, the father of novelist Thomas Wolfe. The prison complex underwent extensive renovations in the 1940s, 1960s, and 1970s, and rebuilding in the 1980s. Today it is the intake site for all male felons over the age of 22 with sentences longer than 20 years. A photograph of a portrait of Joseph Gales Senior. Image courtesy the State Archives of North Carolina. to 1799 when it was founded by English immigrant Joseph Gales, who had already successfully published several newspapers in England. Gales ran the paper until his retirement in 1833. Under his leadership it was one of the major publications in the state and was widely regarded as the leading political voice for the Jeffersonian Repulicanism. Gales started publishing the paper semiweekly only when the General Assembly was in session, but eventually settled upon weekly publication. He brought his son, Weston, in as a partner, and Weston would eventually go on to be the paper’s publisher. It became a daily under Seaton Gales, grandson of the founder, who enlarged the paper’s operation and added a telegraph service. His efforts, though, soon proved unsuccessful and by January 1851, the Register had stopped publishing each day. Gales tried to revive paper by retrofitting its offices with the latest technology, but it was sold at public auction by 1856. An image of Lane from Lunsford Lane; or, Another Helper from North Carolina via LEARN NC. On May 30, 1803, Lunsford Lane was born into slavery in the household of Sherwood Haywood, a Raleigh banker. The Haywood acknowledged the Lunsford’s intelligence, ambition and talent for business. As a boy Lunsford began to pursue entrepreneurial ventures in Raleigh. He developed a variety of enterprises that included selling commodities he kept in a rented warehouse and operating a successful tobacco business where he invented a unique pipe and popular tobacco blend. Savings enabled him to purchase his freedom in 1835 and move to Massachusetts where he published The Narrative of Lunsford Lane. There he worked to raise money to free his family. The title page of Lane’s book. Image from UNC-Chapel Hill Libraries. 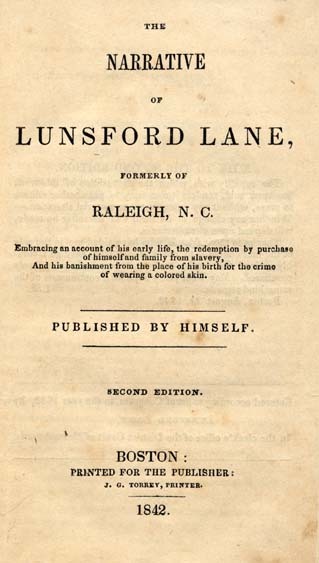 Lane’s 1842 Narrative provides an account of the extremely rare occurrence of an enslaved man who managed to develop a highly successful business despite the impossible constraints of a legal and social system that took away his right to the products of his own mind and time. Lane’s story recounts his awareness of the need to be invisible and play within the rules and yet his growing disillusionment with the immoral legal and social system that conspired against him, even after he purchased his freedom. Returning to Raleigh in 1839 as a free man, he purchased a home and continued his tobacco business aiming to free his family. He was soon banished by a law preventing the immigration of free blacks into the state. Returning again in 1842 to free his family, he was arrested for being an abolitionist. Lane eventually freed his wife, mother and seven children, and the family made their way to Massachusetts where Lane spent the rest of his life working and lecturing on abolition. He died around 1863, although the location is unknown. Lane’s book is available online through the Documenting the American South Project at UNC-Chapel Hill. A cane that was once used by Davis and given to Jones (right) and an article describing how Jones gave the cane to what’s now the N.C. Museum of History. On May 10, 1865, James H. Jones, valet to Confederate President Jefferson Davis, was captured near Irwinsville, Georgia, with Davis after warning him of the approaching federal troops. Jones had stayed awake through the night to warn Davis and his party of any Union forces on the horizon. Upon being captured, Jones was taken with Davis and the rest of the group to prison at Fort Monroe near Norfolk, Virginia, though Jones was released less than a month later. Jones in 1915. Image from the N.C. Museum of History. Jones returned to Raleigh, where he was living before meeting the Davises. He became a pillar of the black community there, going on to attend two freedmen’s conventions, serving as a city alderman and working for several railroad companies. He also helped found the state’s first black military company. Jones was native of either Warren or Wake County, and was working as bricklayer and plasterer in Raleigh in 1862 when Davis’s wife Varina fled to the city to escape approaching Union troops. Jones was recommended to Varina, who hired him on as a servant before she returned to Richmond later that year. Jones remained with the Davises until their capture and called the former president of the Confederacy “my best friend” after learning of his death in 1889. Buildings on the O’Kelly School campus, circa 1928. 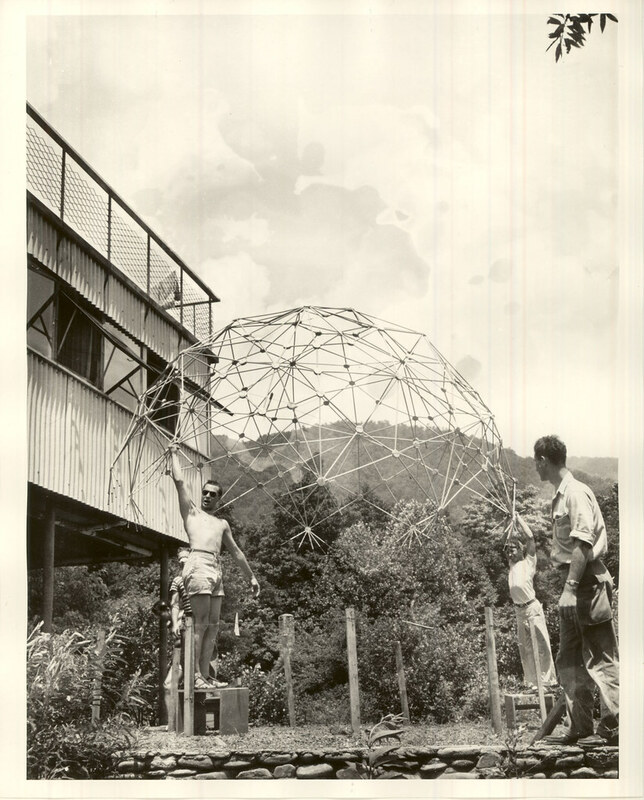 Image from the University of Virginia. On April 4, 1928, the completion of the 4,000th Rosenwald school project, two additions to the Berry O’Kelly School in the Method community of Wake County, was celebrated. The school was able to add two buildings—one with a large classroom and administration space and a second featuring a shop for teaching the trades—thanks to the generosity of local businessman Berry O’Kelly and former Sears Roebuck & Co. CEO Julius Rosenwald. The additions transformed the school into a fully developed campus with more than eight buildings that included dormitories and dining halls. Julius Rosenwald (left) with Berry O’Kelly at the dedication of the 4000th Rosenwald school. Image from the University of Virginia. Originating during Reconstruction as a Freedmen’s village west of Raleigh, Method experienced significant development in the 1890s and early 20th century due in large part to the efforts of Berry O’Kelly, a successful businessman who had a strong interest in the improvement of educational opportunities for rural black children. O’Kelly devoted much of his philanthropy to the school that adopted his name. Through his association with Booker T. Washington, O’Kelly met Julius Rosenwald, who was inspired by Washington to provide financial assistance for the construction of more than 5,300 schools for African Americans across the South. The Berry O’Kelly School, acclaimed as the best school for black children in North Carolina, drew students from across the state. Today the shop building, a playing field, and a gymnasium survive as part of the Method Park and Community Center. Born into slavery in 1858 in Raleigh, Cooper graduated from St. Augustine’s Normal School and then earned a B.A. and an M.A. in mathematics from Oberlin College in Ohio. She taught for a few years in Raleigh before moving to Washington, D.C., to teach there. In 1892, she published A Voice from the South, one of the first comprehensive statements of black feminism. Her analysis of racism, sexism and subjugation of black women would echo into the black feminist movements of the 20th century. Cooper devoted her life to the advancement of gender and racial equality and higher education of black women, published essays, made speeches and was active in black women’s uplift organizations. At the age of 66, Cooper became the fourth African American in the nation woman to receive a Ph.D., earning her doctorate from the Sorbonne in Paris. Working well into her nineties, she spent her final thirty years at D.C.’s Frelinghuysen University, a school for working-class black adults. She died in 1964 and is buried in Raleigh. On November 23, 1963, as the clock neared midnight in Raleigh, an attempt was allegedly made at the Dallas County jail on behalf of Lee Harvey Oswald to contact one or two phone numbers in the 919 area code. It was the day after Oswald was arrested for the assassination of President John F. Kennedy. What has come to be dubbed the “Raleigh Call” went unrecorded in the Warren Commission investigation. Later in the 1960s, one of the Dallas County switchboard operators on duty that night shared a story about the call with authorities. Truman speaking at the statue dedication. Image from UNC-Chapel Hill Libraries. On October 19, 1948, President Harry S. Truman visited Raleigh and delivered the main address at the unveiling of the “Presidents North Carolina Gave the Nation” monument on Union Square, which surrounds the State Capitol. The work honors the three presidents born in North Carolina: Andrew Jackson of Union County, seventh president of the United States (1829-1837); James Knox Polk of Mecklenberg County, eleventh president of the United States (1845-1849); and Andrew Johnson of Wake County, seventeenth president of the United States (1865-1869). Interestingly, while North Carolina claims all three presidents as native sons, all were elected while residents of Tennessee. Image from UNC-Chapel Hill Libraries. The idea for the statue was conceived by Commissioner of Revenue A. J. Maxwell. He took the idea to several legislators and a resolution calling for the monument’s creation passed the General Assembly in March 1943, though work didn’t get underway until a commission was created to complete the project in 1945. Several sculptors submitted designs for the monument, but the commission ultimately chose New York sculptor Charles Keck for the project. It was one of Keck’s last major works as an artist. Governor R. Gregg Cherry, Secretary of the Army Kenneth Royall, U.S. senator and former governor Clyde Hoey and descendants of each of the three presidents joined Truman in dedicating the monument. 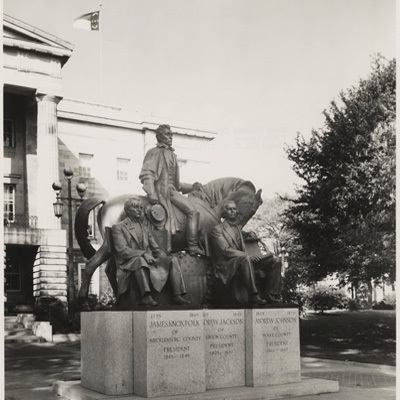 Visit: See the statue for yourself on the east side the State Capitol in Raleigh, and learn more about presidential history at the President James K. Polk Memorial in Pineville. 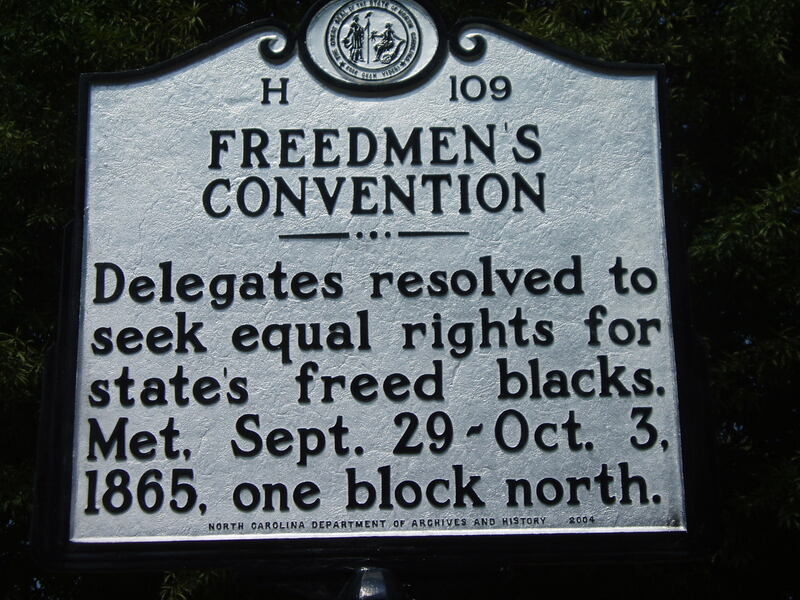 On September 29, 1865, five months after the close of the Civil War, the “Convention of the Freedmen of North Carolina,” a statewide assembly of African Americans began at the African Methodist Episcopal Church in Raleigh. The convention lasted four days, and 106 men attended. Under President Andrew Johnson’s Reconstruction plan, the state was required to hold a convention in order to nullify the Ordinance of Secession, abolish slavery and void the Confederate war debt. Only when this was done would Congress consider North Carolina’s bid to rejoin the Union. That mandatory convention was scheduled to take place at the State Capitol on October 2. Since only whites could vote to elect delegates to this convention, the voice of the former slaves would not be heard. 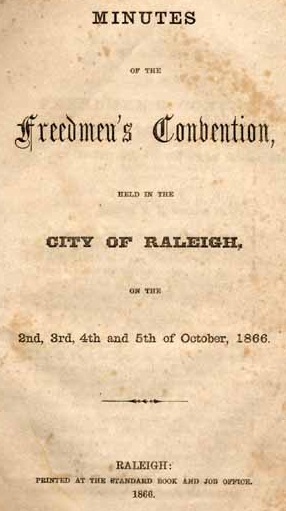 The Convention of the Freedmen of North Carolina was timed to draw attention away from the white convention by starting three days earlier. Its purpose was to discuss and make known issues important to the former slaves. James Walker Hood of New Bern was elected as the convention’s president. Hood stressed that “equal rights before the law” should be the convention’s watchwords. The delegates pressed for rights to testify in court, to serve as jurors, to act as counsel and to vote. The convention closed on October 3. Join the N.C. African American Heritage Commission and the N.C. Civil War History Center for a symposium on the convention Oct. 1 in Raleigh.